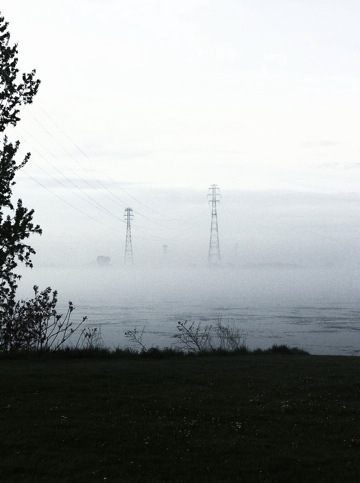 We don’t see fog often in Montreal. Not like the UK where it is an almost daily occurrence! (I’m English, I can say that. You’re not, so you can’t!). So being a phenomenon that is rare, it makes for an interesting ride in to work. Figures suddenly appear in front of you where seconds before there was nothing. The tops of the trees are invisible to the eye and there is a mist that shrouds the surface of the lake. It is beautiful. It is also humid. Very humid in fact, and by the time I am at the half way point my back is soaking wet against the weight of my back pack and I can see that the hairs on my arms are matted as if it was raining on them. Except it’s not. 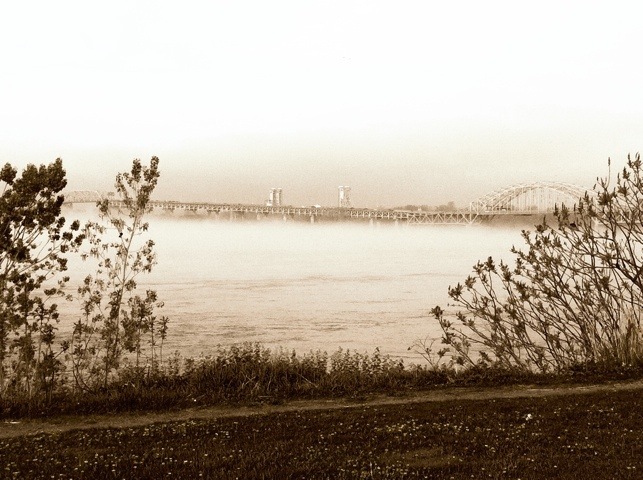 The Mercier bridge cuts an especially dramatic image standing out of the mist. I wish we had more mornings like this one. Sublime.